Payment is to be made by BACS transfer, cash or cheque. For debit or credit card, the company reserves the right to impose a surcharge of 1.2%. The customer shall grant the company’s employees access to the premises at reasonable times for the purpose of taking measurements and of carrying out the work specified. The company’s standard payment terms are a 50% deposit on order, a 40% stage payment due approximately 4-6 weeks before installation and a final 10% balance, plus any additional cost due immediately after the final day of installation. In the unlikely event that you are not completely satisfied with your installation, either due to product faults or an outstanding snagging list then you are entitled to withhold 10% of your total final invoice until the company has rectified all of the problems. The remaining 90% balance of that invoice must be paid in full beforehand. If you wish to cancel your order you must write to inform us immediately, before the company undertakes a technical survey for a full refund. Should the company have already completed or begun the technical survey then we reserve the right to withhold 7% of your order value or £500.00 (whichever is the greater amount) to cover the costs already incurred. If you wish to cancel your order after the survey has been completed and after the products have already been signed off, by you the client, for production then you will be liable to pay the full contract value as detailed in your Order Acknowledgement. The delivery or installation period quoted is that anticipated at the time of the order and will be improved upon if at all possible. The company will not be liable for any delay in installation which is due to factors beyond the reasonable control of the company. If the work is not completed within any delivery period quoted to the customer, the customer may serve written notice on the company requiring that the works be completed within a reasonable period, being at any event not less than eight weeks, in the interests of certainty it is recommended that this notice is sent by recorded delivery. We do not accept responsibility for any delay to other trades that have been booked for work to be undertaken after the installation. We would recommend trades are booked after the installation is complete. a) The company warrants that, for a period of 30 years from the date of the delivery, engineered timber goods shall be free of rot or fungal infection under normal conditions. Iron in any form is susceptible to rusting. The company does not warrant against corrosion of our iron fittings. The finish on black hardware will wear off through normal use, and will need to be touched up with an appropriate metal paint. Over time, brass may become discoloured. This is a natural process and does not constitute a fault. The company does not warrant against discolouration of brass fittings. Under severe exposure conditions it may be necessary to carry out some minor maintenance prior to the normal guarantee period. Over a period of years some paint or stain finishes may exhibit slight variation from the original colour. This will not affect the performance of the decorative system and does not constitute a fault. d) Save as aforesaid all warranties and conditions, expressed or implied, are hereby expressly excluded. e) The foregoing warranty is subject to notification in writing to the company of any alleged defect within 7 days of its occurrence or discovery. f) The foregoing warranty does not extend to damage or faults due to accident, misuse or neglect. property at which the installation is carried out. sold and therefore, at the latest within 7 days of the property title being registered with Land Registry. i) Liability of the company under the foregoing warranty or otherwise shall be linked to replacement of the goods supplied by the company, or, at the company’s discretion, the actual cost charged by the company for the goods. The company shall be under no liability in respect of any consequential damage, loss of profit, damage suffered or expenditure incurred whatsoever, whether in contract or tort, in respect of any faulty goods. j) Any replacement goods shall be warranted only until the expiration of 10 years from delivery of the original goods. Any special order handles will carry their own guarantee which will be confirmed upon order. The company will remove from site all old frames and materials unless the customer instructs the installer to the contrary on the day of installation in which event the company does not undertake to salvage frames or other materials in re-useable condition. The company undertakes to make good any damage caused during installation to plaster, floor, rendering or brickwork immediately surrounding any window or door installed by the company. The company does not accept responsibility for damage which is attributable to structural weakness or defect in the property at which the installation is carried out. Neither does the company undertake to match existing external finishes or to provide matching ceramic tiles or other tiles or to avoid damage to surrounding wallpaper or paint work. Without prejudice to the limitations of this paragraph any claim by the customer or compensation for damage done by the company must be made in writing to reach the company within 14 days of the damage being caused. It is the customers responsibility to remove and subsequently re-install curtains/blinds/shutters and ornaments, furniture and fittings from the immediate installation area. It is not claimed and no guarantee or warranty is given nor do the company’s agents have authority to represent or warrant that installation will reduce, eliminate or be free of condensation. Timber is a natural product and although every effort is made to ensure that the timber used is the most suitable available, the company shall not be liable for any damage resulting from movement within the timber. Timber also requires periodic re-coating by the customer. The company shall not be liable for re-painting or re-staining timber products. It is the responsibility of the customer to obtain any necessary planning permission or other permissions required prior to installation. If necessary the customer shall at his own expense remove or re-site prior to installation any gas, electrical, plumbing, television, alarm or telecommunications installations and connections. It is not always possible without a detailed examination by the company’s surveyor to assess accurately the cost of carrying out the adjustments to any existing window or door frames and ancillary fittings which might be necessary in order to fit replacement windows and doors as well as any unforeseen building works such as lintels and/or any other such structural requirements for the safety of an installation. When a charge for such adjustments has been included in the contract but the company’s surveyor is of the opinion following a detailed examination that such charge is inadequate to cover the costs of such adjustments then the company shall be entitled to increase the charge for such adjustments to such amount as shall cover such costs (but not a greater amount) by giving written notice of such increase to the customer within 14 days of the visit of the surveyor. In the event of such notice being given the customer shall be entitled to cancel the contract by giving written notice of such cancellation to the company within 14 days of cancellation. With bay window replacements it may be necessary to retain the existing frame head of the bay. This will be determined by the company’s surveyor. If the company has not agreed in the contract to carry out such adjustments they shall be the responsibility of the customer and shall be carried out by the customer prior to the installation. Scaffolding is required for certain installations. If this is required then the company shall make the necessary arrangements for the erection of such scaffolding but the customer shall be responsible for paying for the same at cost. If on the survey the requirement for scaffolding is not picked up and is thus needed at a later date during the installation than the responsibility and cost falls solely on the company. Where contracts are negotiated away from the business premises, if the customer is unhappy with the contract for any reason it can be cancelled and a refund of the deposit can be obtained by giving notice in writing addressed to the company sent within 7 days from the date on which the contract was signed. In the interest of certainty, it is recommended that any cancellation is sent by recorded delivery. All terms of the contract between the customer and the company are contained in this document. No representation is made by the company save as appears herein. No variation of or addition to the work the work specified in the schedule shall have effect unless agreed in writing under the signature of a duly authorised officer of the company. 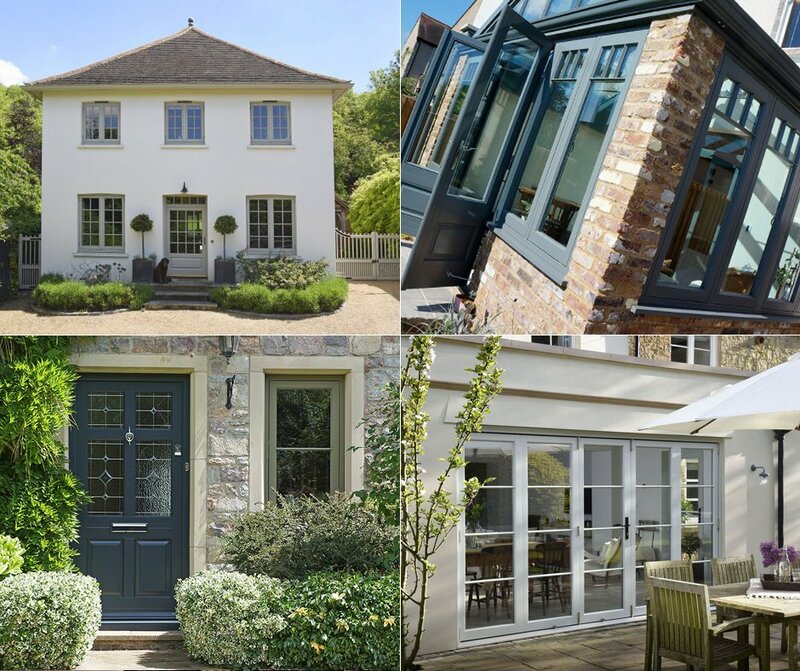 uPVC windows and doors carry a 10 year guarantee. Aluminium products carry a 20 year guarantee (once registered by the client with Origin). Sealed units products carry a 10 year guarantee, where the company will replace units free of charge, however, the company reserves the right to charge for labour. Exclusive uPVC Bygone Sash Windows carry a 12 year guarantee across the board including double glazed units. Where original existing stained glass has been retained and restored and fitted within a new double glazed unit it is common for ‘dust’ debris to collect within the new double glazed unit. This is normal due to the age of the stained glass, and the company would not be liable for this. Units with re-housed stained glass carry a maximum 12 months guarantee. It is the customers responsibility to check the detailed specification that is provided after the completion of the survey. The client will need to sign each page of the order confirming their requirements which may include: timber species / uPVC profile / colour finish / glazing type including obscured / hardware and all relevant specifications detailed within the document. Any changes requested after the document has been returned and products have been ordered by the company will incur additional costs.